Luckey Deva is a musician whose songs and dramas have inspired positive change. His popularity and recognition as an artist date back to his days as a vocalist with the Golden Chimes in the 80s. He created his latest song for children with Down syndrome. 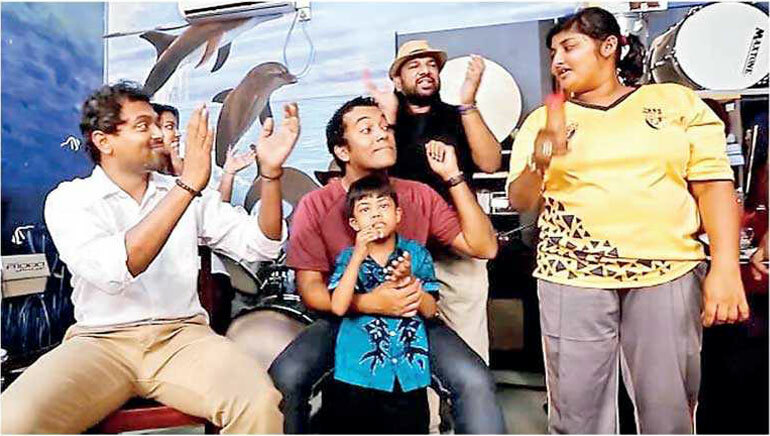 Children from Dilmah’s MJF Centre, Moratuwa, and National Centre for Children with Cerebral Palsy and Other Developmental Disorders, joined Luckey, along with a group of renowned local artists for this special project. The lyrics in this song have been instrumental in creating awareness and social change, bringing children and youth with Down syndrome to voice their concerns and feelings to the world. Currently, Luckey serves as the President of Moratuwa Arts Forum, dedicating his time to music and social work. As a freelancer, he provides psychosocial support for the children at MJF Centre Moratuwa. Q: What initially drew you to write this song? A: Love propels you to do amazing things. The song was born of my deeply-rooted love and hope for children with disabilities. For me, writing songs is a way of letting my heart out. I see children with Down syndrome as flowers who are worthy of love and dignified life. I penned the lyrics of this song, and infused visuals and melody into them to create a thoughtful, powerful, and meaningful song, that urges you to give them the love that they deserve. Q: You talk about flowers in your song. How do you equate flowers of different petals with children to talk about the importance of inclusivity? A: Children, just like flowers, are pure, innocent, and also fragile. In my song, I described children with disabilities as flowers who are trying to bloom and smile. They have their own fragrance and value. We cannot reject these flowers. An anthurium or a white lily is as beautiful as a thousand-petal lotus. We just need to mix all these flowers to make the garden beautiful, and give every flower its value. I see this inclusivity at MJF Centre, when children from the Rainbow Centre interact with other children. They play cricket, make music, and even perform together on stage. It is beautiful. Q: What is the key message that this song gives to the society? A: This is one of the most moving and thought-provoking songs I have written. The lyrics will channel your ability into seeing the value of every ‘flower’. I do not want this song to arouse sympathy. I felt emotional when singing this song by myself - because I wish others could see the value in them as I do. The words echo the sentiments of families of the Down Syndrome Community - It’s not a plea, but a loving request to give them the support to stand out, blossom as much as they can. Because, if provided with opportunities, these flowers can indeed make a difference. Q: As the lyricist and composer of this song, do you have any memorable moments that occurred while producing the music video to share? A: My contribution to this creation is in its melody, music, lyrics, and visuals. I also assisted the filming crew with direction and production. I wrote the script of this video to evoke real feelings in children and parents. Shooting the music video was challenging, especially given that it involved working with children with Down syndrome, cerebral palsy and other developmental disorders. We had to let them be themselves to elicit natural movements for the visuals. We wanted to keep the authenticity of their lives by capturing the most natural expressions. 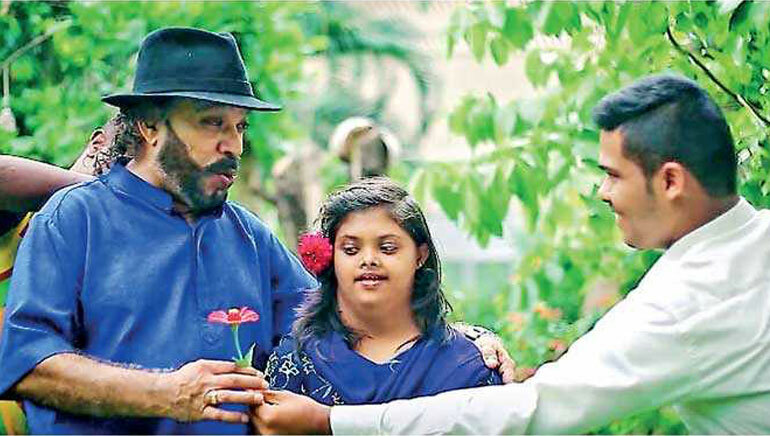 There’s a scene where a boy with Down syndrome offers Sunil Perera a flower - it was a beautiful coincidence. We played the song while the video was being produced, and the children too joined us. It has a catchy tune, and the kids immediately connected with the sounds and syllables and started lip-synching. Q: Let’s talk about other famous artists who are featured in this video. A: The video production of the video was funded by Dilmah’s MJF Charitable Foundation, and celebrity figures gave their time voluntarily to be featured in this video. I invited some of my acquaintances in the music industry to join this project - my friendly request was welcomed with an overwhelming response. Malini Fonseka, Bathiya and Santhush, Sunil and Piyal, the late Ronnie Leitch, Amila Nadeeshani, and the De Lanerolle Brothers volunteered in this project. When I conveyed the idea in my song to every artist, they did not hesitate to be a part of it. They sang their hearts out with the children. Everyone had a good time. Q: The song calls for unity and positive change. How do you continue your efforts to reinforce this message through music? A: We are flowers from the same garden. We all need to come together to uplift the lives of children with disabilities. This is a collective effort. Changing the lives of children has always been my passion. I use drama and music as a medium to develop the minds of young children who come from vulnerable backgrounds. I always strive to create better things. This is not just a job, but a craft that makes art which touches hearts. The song has fulfilled my dream. If I can do better, I will do the best I can to change the lives of these children. Q: How did people receive this song? A: The response was overwhelming. The song has spoken to many, and the words have certainly made them understand the value of kids with Down syndrome. The chorus of this song is trilingual - which makes this song even more special. We even had people calling us from abroad. Upon its release, we got a call from Sri Lanka Broadcasting Corporation to come in for an interview with the kids. Q: How did you get involved with the MJF Centre in Moratuwa? A: My affiliation to MJF Centre started at MJF Media, where I created dramas that were intended to spark a social change. It’s been a rewarding experience. Q: How is your connection with the children at MJF Centre Moratuwa? A: Amazing. The Rainbow Children radiate happiness whenever you are around them. MJF Centre shows them that there is a world full of possibility, where they can blossom and shine just like other children. Every time I come to the Centre, I see how these special flowers are watered and treated with love and care. When I have my lunch, they sometimes join me for a friendly chat. I don’t have sympathy for them; it is just a bond shared by mutual love and respect for one another. Q: Anything that you would like to share with us? A: Children with Down syndrome are like angels. They have no selfish motives. Their pleasures and emotions are transient. They fight, have fun, and enjoy the fine things in life just like we do. Parents, let your child be. Don’t forget that ‘Flowers that blossom with unmatched, asymmetric petals, will still have a fragrance’ if treated well. 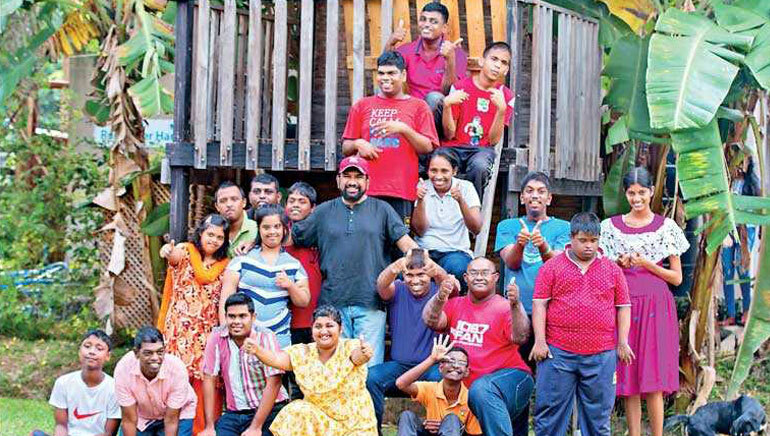 The Rainbow Centre at Dilmah’s MJF Centre in Moratuwa is a haven for children with disabilities, and provides free services for them, as well as their families. In addition to this, The Centre gives children, youth, men and women - an opportunity to be their own person and equips them with independence, confidence, and the skills to face life, regardless of the circumstances.